I'm probably the 10 millionth food blogger to post this recipe. It's a Weight Watchers-friendly recipe gone viral via Pinterest. 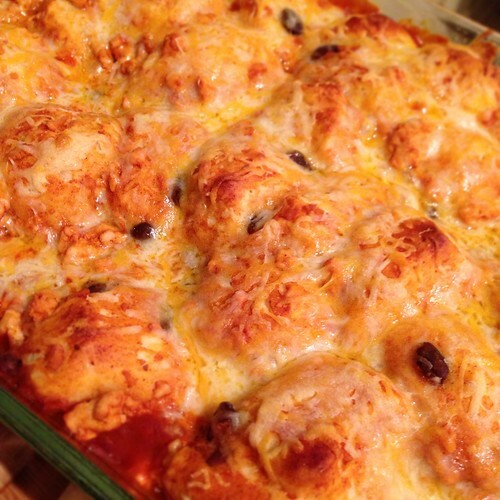 Cut Pillsbury biscuits (low fat, if you follow the recipe, or regular, if you're me and shop at Trader Joe's) into quarters, toss with enchilada filling, and bake. Super easy. Honestly, I prefer the tortilla version, but this was an easy weeknight meal that I might make again, especially since the turkey filling won the picky baby seal of approval. 1. Preheat oven to 350 degrees. Lightly mist a 9 x 13 baking dish with cooking spray and set aside. 2. Brown turkey in a large skillet or sauté pan. 3. Add the enchilada sauce, tomato sauce and black beans and stir to combine. Stir the biscuit pieces into the meat mixture. 4. Transfer the entire mixture to the prepared baking dish and spread out evenly. Bake for 25 minutes. Remove from the oven and sprinkle the cheese on top. Bake an additional 10 minutes. Let stand for 5 minutes before serving. OK. This sounds delicious! I'll definitely cook these. Thanks!